Offered here in Pratesi Firenze’s famous Brunelleschi Italian leather. 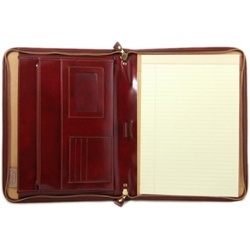 If you’re looking for the absolute finest leather portfolio, you have certainely found it here! Gift baskets are a great gift for anyone and here is one that uses a Santa’s bag instead of te same old Gift basket. Holiday candy and cookies in this will tempt everyone with taste sensations to enhance this year’s holiday celebrations. The Santa’s bag can be used year after year to bring back memories of your lovely gift of good taste. 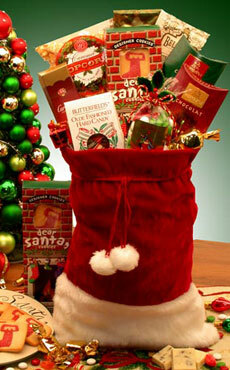 The Santa’s bag may include: Velvet Santa Bag, Butterfields Old Fashioned Holiday Candy, 4 oz. Holiday Caramel Corn, Happy Holidays Spice Drops, Deer Santa Holiday Shortbread Cookies, White Chocolate Holiday Cocoa, Caramel Mocha Cappuccino, Chocolate Cherry Delights, Chocolate Mints, Ghirardelli Chocolate Bar. You can buy in on this site. Do you know anyone who hates their boss? 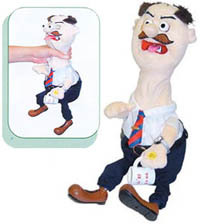 Get them the Boss Strangle Doll! Squeeze the neck quickly and you tell him what you think of him. Squeeze neck Fiercely and its eyes bulge, cheeks redden, tongue extends and limbs flail. We recommend that you seek this sort of stress relief out of the sight of your actual boss!